Twenty-four true, wide-ranging tales of crime, history, human behavior, illness, and ethics, told from the personal perspective of the author, an eminent physician-lawyer who uses the stories to illustrate the principles of human genetics and to discuss the broader issues. About the author: Philip R. Reilly earned his undergraduate degree at Cornell University, studied human genetics at the University of Texas Graduate School of Biomedical Sciences, and graduated from Yale Medical School in 1981. He did his medical residency at Boston City Hospital. He earned board certification in internal medicine and clinical genetics. He has served on the Board of Directors of the American Society of Human Genetics, and he is a Founding Fellow of the American College of Medical Genetics. He twice served as President of the American Society of Law, Medicine, and Ethics. During the 1990s, Reilly was the Executive Director of the Eunice Kennedy Shriver Center for Mental Retardation in Waltham, Massachusetts, a nonprofit that worked on understanding childhood and adult neurological disorders. Dr. Reilly has held faculty positions at Harvard Medical School and Brandeis University. Since 2009 he has worked as a venture partner at Third Rock Ventures in Boston where he focuses on helping to start companies to develop innovative therapies for orphan genetic diseases. Over the years he has published six books and many articles about the impact of advances in genetics. Reilly frequently works with patient groups who are concerned with rare genetic disorders. Abraham Lincoln: Did He Have Marfan Syndrome? Violence: Do Mutations Cause Crime? Wrongful Birth: What Should the Doctor Know? Behavior: Do Genes Make Us the Way We Are? Mental Illness: How Much Is Genetic? Personality: Were We Born That Way? Gay Genes: What's the Evidence? Genetically Modified Organisms: The Next Green Revolution? Cystic Fibrosis: Should Everyone Be Tested? Alzheimer Disease: Are You at High Risk? Privacy: Who Should be Able to Know Your Genes? Frozen Embryos: People or Property? Cloning: Why is Everyone Opposed? Eugenics: Is it Possible to Improve the Gene Pool? "Reilly uses Abraham Lincoln's DNA to teach the science's basics. . . . But Reilly's pace is always fast, and his descriptive powers are a joy. . . . In the end, Reilly argues that learning how genes work may be the easy part. Understanding and living with the consequences may be the harder part." "The technical complexity of genetics, one of the obstacles to public understanding, is a veil that can be penetrated by good writing: for example, by interesting stories about people and practical uses of genetics. 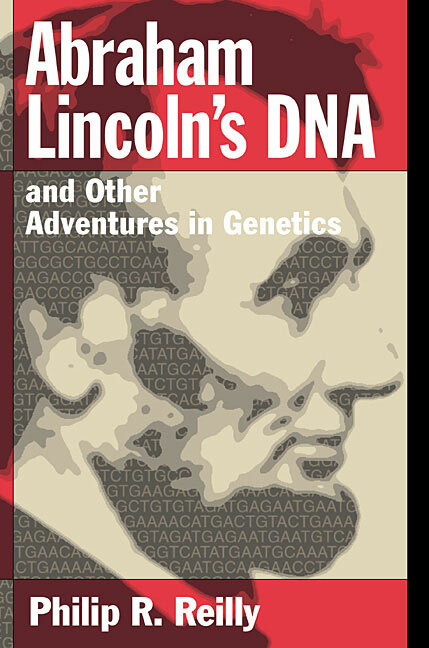 In this spirit, Philip Reilly contributes 24 lovely essays about diverse uses of genetic technologies in Abraham Lincoln's DNA. . . . designed well for use in teaching or public speaking." "The 21st century has begun with an overwhelming outpouring of advances in molecular biology and genetics, and the medical profession has only started to wrestle with the many social and moral questions posed by the startling progress in these fields. Indeed, as Philip Reilly suggests in this straightforward and readable collection of intertwined essays, society as a whole must confront these questions. For laypeople and professionals alike who yearn for a better understanding of genetically engineered crops, DNA fingerprinting, cloning, or gene therapy, here is a valuable addition to a small but critical literature that will frame our public discourse as we decide how to use the burgeoning knowledge of the genome." "This enjoyable and readable book consists of 24 essays, four under each of 6 subjects that cover an impressive range of genetic topics, all currently of headline-making importance. The book is written to be accessible to the layperson but it contains much to illuminate undergraduate lectures and most students will learn a great deal from it. It will appeal to a varied readership and it is strongly recommended. . . . The author's first hand experience of ethical and public policy issues means that the book is full of fascinating examples gleaned from his exposure to genetic controversy." "[Reilly's] personal experience and knowledge of the field make it an interesting and enjoyable book for biologists, but his skill at writing makes this a relatively easy and informative read for any others with a passing interest in genetics. . . .
What makes this book different from others is the organizational method. Within each chapter he focuses on an individual or group and explains the genetics related to their situation. As he goes through the explanation he describes the current and historical research that has led us to our present understanding, covers numerous closely related subjects, and when applicable, shares his own personal experiences dealing with some of the issues. I especially appreciate his musings within each chapter on where research in these areas is eventually going to lead."